Stargirl: Geoff Johns Confirms The JSA & S.T.R.I.P.E. The Stargirl TV series for DC Universe will feature S.T.R.I.P.E. and the Justice Society of America, with new details revealed by Geoff Johns. A very personal creation from DC Comics’ Geoff Johns, Stargirl, is yet another character coming to the DC Universe streaming service in her own original series… and it seems that she’s not the only element from her comic book history that Johns will be bringing to the show as creator, writer, and Executive Producer. 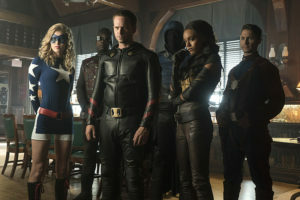 The Justice Society has appeared on television before, of course: The team appeared in a two-hour episode during Smallville Season 9 that was written by Johns himself; a movie event titled “Absolute Justice.” That story also introduced Stargirl in her first television appearance, where she was played by Britt Irvin. Later, Stargirl was part of a 1940’s-set JSA in DC’s Legends of Tomorrow. There, the actor playing Courtney was Sarah Grey. 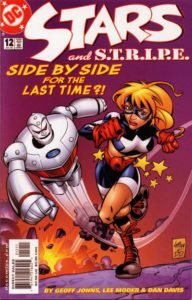 The JSA aren’t the only heroes from Stargirl’s comic book history that are coming to the DC Universe original series: Her own iron giant, S.T.R.I.P.E., is also present. Johns also addressed whether or not Stargirl will be connected to other series. “Right now, for me, Stargirl is its own show, with the Justice Society,” Johns said. That doesn’t mean we wouldn’t eventually do something like that. But, the goal is just to make a great Stargirl show right now, and if it happens to interconnect in the future with other things, great. I love that it’s such a different tone than Titans and Doom Patrol that we’re working on, because [DC Universe] should have different kinds of shows. I think it’s important to have a diversity of tones instead of everything fitting the same tone. I wanted to do Stargirl for a variety of reasons, but part of it was because I wanted to do something fun and young. Stargirl is still a little while away from its DC Universe launch, but you can stay updated on the project by following @StargirlTV on Twitter and visiting our brand-spanking-new Stargirl TV Facebook page!